The Whiting-Turner Lecture Series celebrates the fearlessness of entrepreneurship and brings leading technology enterprise thinkers who deal with the real-world challenges of a fast-paced, global economy to campus. 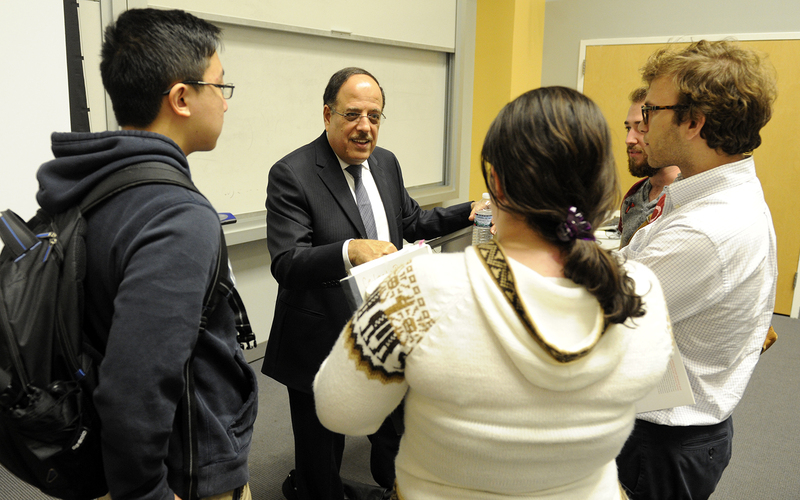 Students speak with Dr. Naguib Attia, Vice President of IBM Global University Programs, after his Whiting-Turner lecture. In their lectures and question-and-answer sessions, speakers share their insights and experiences as well as their lessons and advice, inspiring students and faculty to apply new ideas and approaches to their careers and ideas for new ventures. The Clark School would like to thank the Whiting-Turner Contracting Company for supporting this lecture series. Will Clean Energy Take Our Economy to the Cleaners?